A few months back, I made a lamb stew, that in my opinion trumped my prior lamb shank undertakings. I used the Craigie on Main recipe, that happened to coincide with every leftover in my pantry. Today, I am recreating the same, but doing so en cocotte (which sounds significantly fancier then it is!). This somewhat popular preparation style from Ukraine (brought over from France) in individual clay pots, is exactly what I've been craving this entire week of freezing weather. In the days before takeout...or rather in the location/time before takeout containers, as a kid, I recall being super excited about a mini treasure, all mine, beneath the lid. My mom would make incredibly fragrant stews and juliennes in lidded containers, and I bet it'll please E as well. 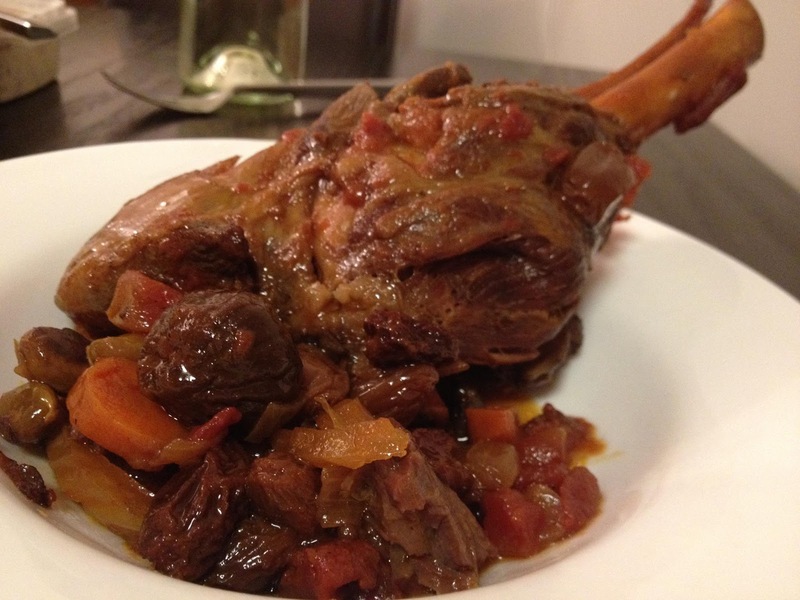 To adopt the same recipe, use boneless lamb shank, or debone with a sharp knife. Cut into cubes (1"x1"), and marinade as instructed in the original recipe. The smaller size of the meat, allows for a quicker marinade (but for the truely committed, do marinade overnight). Follow step 3, however reduce cooking time to 10 minutes. Follow the rest of the steps, however use the individual pots instead of the dutch oven. Layer ingredients with meat at the bottom, spices (in small sachets, or in "reused" tea bags) atop the meat, dry fruit and then the vegetables. Pour the chicken stock over the layers, 3/4 way to the top of the pot. Replace the lids, set the pots into a cookie sheet to prevent spils, and set into the over at 325. After 2 hours or so, the meat should be perfect. Remove from the oven, let stand for 10 minutes and serve carefully (with kids, it may be a good idea to let the stew cool longer). This soup couldn't be easier. In a heavy stock pot, in olive oil, quickly brown osso buco, about 2 minutes on each side. Add about 2 quarts of water, and bring to boil. Remove foam from the top, and let simmer for about 30 minutes, continually clearing the top to make a clear stock. Cover and cook for about 30 more minutes, until the osso buco is adequately softened. Add in chopped spring onions (3 mm in thickness or so), white and green parts. Add in the spinach. Cook for about 15-20 minutes to low-medium heat, covered. Season with salt and pepper. Serve with sour cream and half of a hard boiled egg, sliced into the soup. In a non-stick pan, roast shallots until golden. Add chopped mushrooms to the pan. Roast until reduced by a quarter in volume. Add cherries. Add in the cous cous and toast for about 3 minutes. Add stock, stir and change heat to medium-low. Cover with lid and simmer until all the liquid is absorbed. Add peas and carefully stir to incorporate them. Remove from heat after about a minute. Sprinkle with tarragon. Season with salt and pepper.